Tim Sherwood is interested in reuniting with Swindon Town midfielder Massimo Luongo and making him one of his first summer signings for Aston Villa, according to The Daily Mail. Reports of Sherwood’s interest come nearly two years after he sent him on loan to the County Ground in his role as development director at Tottenham, where Luongo was persuaded to sign on a permanent basis. The 22-year-old was named player of the tournament at the Asian Cup earlier this year for Australia in a successful tournament, which saw them lift the trophy. 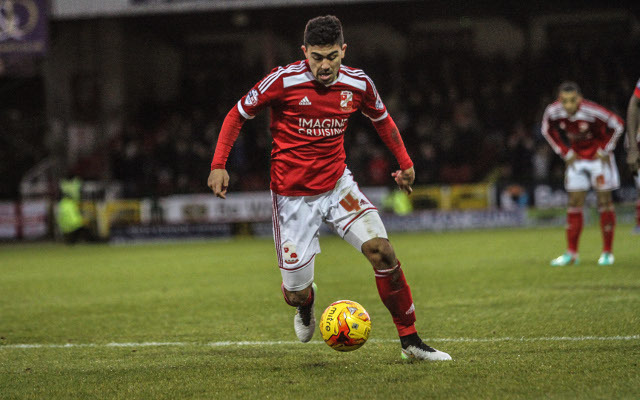 Luongo has won many fans this season and last with dazzling displays at the heart of Swindon’s midfield in League One, and has played a huge role in them attaining their current position of fourth in the table. Despite Sherwood, who has guided Aston Villa to the FA Cup final, already planning for next season, Luongo will be needed by the Robins for the end of season play-offs where they will hope to gain promotion to the Championship. The prospects of the deal look promising for Villans though, as Sherwood used to play with current Swindon Town chairman Lee Power and their relationship will likely help the deal go smoothly.